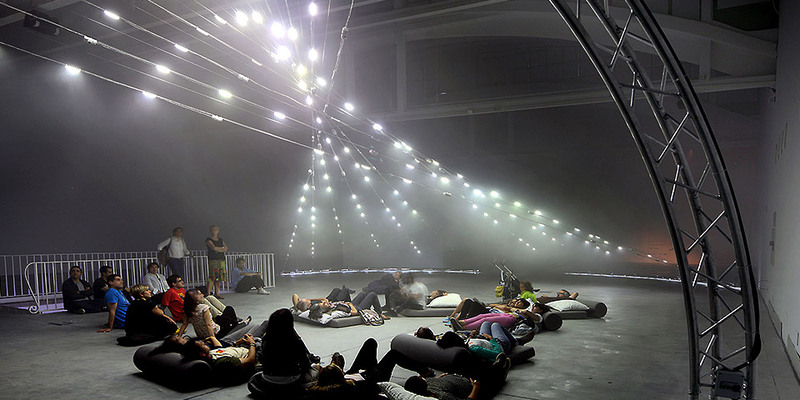 Polytopes literally designate “many spaces”, and were a series of installations created during the 1960s and 70s by composer Iannis Xenakis. Using probabilistic and stochastic modeling to treat architecture, sound, and light as distinctive, superimposable volumes, Xenakis sculpted luminous and sonic masses which enveloped their audiences. 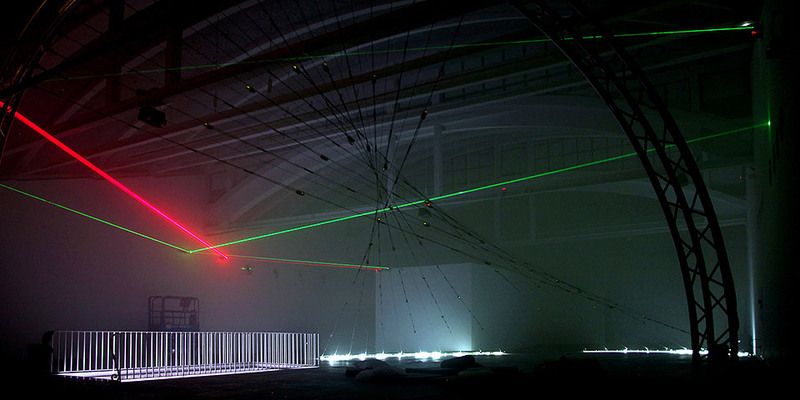 The N-Polytope performance environment and installation employs 21st century computional, audio and light technologies: 150 monochrome LEDs and 50 small custom designed speaker/ electronics/ sensor boxes are suspended from a fine cable grid attached to a truss arch, steel plate mounted architectural frame. Coloured lasers bounced off mirrors complement the LEDS. Wireless sensors pilot the system via an artificial neural network which implements custom-developed Qualia open source software machine learning algorithms. The software agents receive sensor-actuator information from the environment (light intensity, sound frequency/ amplitude) and steer responses in keeping with these predetermined algorithms: “firefly” mode tends towards synchronisation of outputs, based on light levels, whereas “chaser” mode corresponds to rapidly relayed successions of impulses. Individual sensors also constantly respond to local changes, making scripted macro-behaviours prey to discrete, unpredictable micro-events, and endowing the N-Polytope with complex, seemingly lifelike energies that offer a vibrant homage to Xenakis. Chris Salter is an artist, Associate Professor for Design + Computation Arts at Concordia University in Montreal and Director of the Hexagram Concordia Centre for Research-Creation in Media Arts and Technology. He studied philosophy and economics at Emory University and completed a PhD in theatre and computer music at Stanford University. After collaborating with Peter Sellars and William Forsythe/Ballett Frankfurt, he co-founded and directed the art and research organization Sponge (1997-2003). His artistic work has been seen all over the world at such venues as the Venice Architecture Biennale, National Art Museum of China, CTM, Ars Electronica, LABoral, Meta.Morf in Norway, PACT Zollverein, Todays Art, Villette Numerique, EMPAC, Transmediale, EXIT Festival, Place des Arts, Elektra, Shanghai Dance Festival, V2_, among many others. He is the author of Entangled: Technology and the Transformation of Performance (MIT Press, 2010).